Welcome back our Android Architecture Components tutorials series. 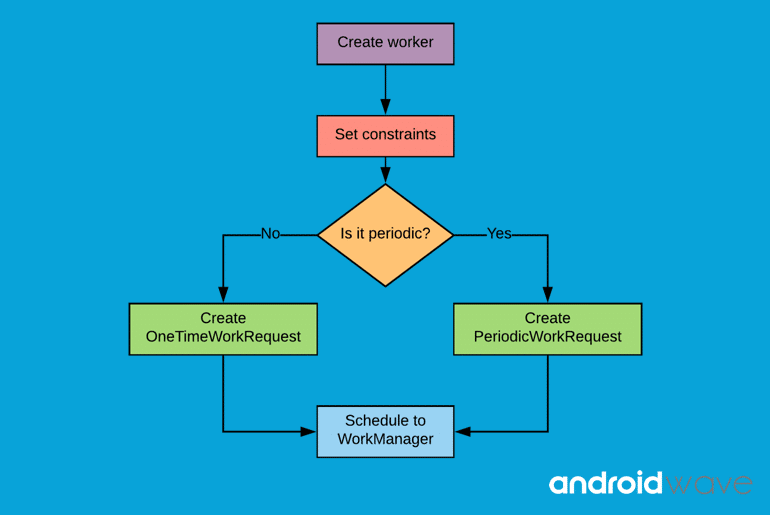 In this article, we will learn what is WorkManager API in Android ? how it works and what are its advantages. So let’s get started. Since Marshmallow, The Android dev team is continuously working on battery optimizations. After that team introduced Doze mode. Then in Oreo imposed various kind of limitation on performing background jobs. Before WorkManager, we use various job scheduler for performing background task, such as Firebase JobDispatcher, Job Scheduler and Alarm Manager + Broadcast receivers. So for the developer perspective, it is difficult to choose which scheduler should use and which one is good. So the Work Manager handles these kinds of stuff. We have to pass the task to the WorkManager and It uses all this Firebase Job Dispatcher, Alarm Manager + Broadcast Receivers, Job Scheduler to perform the background task depending on the requirement. WorkManager is basically a task scheduler, It makes it easy to specify the asynchronous task and when they should run. The Work Manager API helps create the task and hand it to the Work Manager to run immediately or at an appropriate time as mentioned. For example, you might point your app to download new resources from the network from time to time and now the downloading is a task and you can set up this task to run at an appropriate time depending on the availability of the WIFI network or when the device is charging. So this way you can schedule a task using WorkManager. It provides guaranteed and constraint-aware execution. In other words, You can schedule a task depending on the condition when they should run. So WorkManager will take care of all the constraints and give the guarantee that the task will be executed even when the device is rebooted are the app is exited without executing the task and our task will be executed. It provides backward compatibility which means you don’t need to figure out the device capabilities or choose an appropriate API. You have to just hand off the task to the WorkManager. It will choose the best option for the execution of the task. WorkManager supports tasks query, You can not only schedule the task but if you have quite some work or the tasks, you can actually check the status of the state of the task, whether it is running or whether it is quit or it has succeeded or failed. so you can detect the status of tasks. It supports task chaining, this means you can create a draft of your work and enqueue one after the other using the Work Manager. Before moving forward, We have to understand the class and concept of WorkManager. Let’s understand what are various base classes that are used for Job Scheduling. It specifies what task to perform, The WorkManager API include an abstract worker class and You need to extends this class and perform the work. OneTimeWorkRequest– That means you requesting for non-repetitive work. The WorkManager class in enqueues and manages all the work request. We pass work request object to this WorkManager to enqueue the task. WorkInfo contains the information about a particular task, The work manager provides LiveData for each of the work request objects, We can observe this and get the current status of the task. Enqueue the request with WorkManager. Lets we will create demo application using the above steps. For using WorkManager we have to add dependency in app/build.gradle file. So let’s open the app build.gradle file and add below lines. In this demo app we will create a layout. This layout will contain TextView and Button. After that, we will set onClickListener() and this event we will enqueue the WorkRequest to WorkManager and shows the status on TextView. Let open the AndroidStudio and create a new project with basic activity template. Add Button and TextView in activity_main.xml layout files. Let’s move to MainActivity and create a WorkRequest to execute the work that we just created. Now first we will create WorkManager. This work manager will enqueue and manage our work request. Now we will create OneTimeWorkRequest, because I want to create a task that will be executed just once. Now onClick() of the button we will enqueue this request using the WorkManager. So that’s all you need to do. Let us fetch some information about this particular task and display it on tvStatus TextView. We will do that using WorkInfo class. The work manager provides LiveData for each of the work request objects, We can observe this and get the current status of the task. Finally, MainActivity looks like this.